Hrabra mama Leonida sada ima četvoro odrasle dece, mnogo je dobijenih borbi sa roditeljskim izazovima iza nje, ali i dalje bitku vodi sa novim izazovima. Njeni stavovi, iskustva, profesionalno znanje su je stavili na moj spisak Hrabrih mama i sada imam tu čast da podelim intervju sa njom. Ovaj intervju je na engleskom, ali ima i prevod u nastavku. 1. 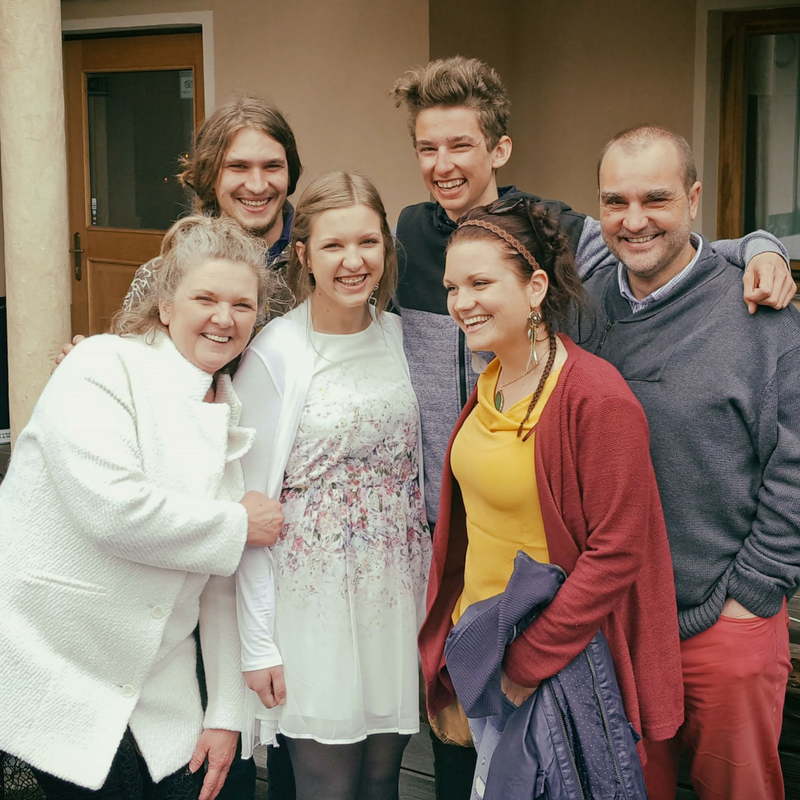 In short – who are you? 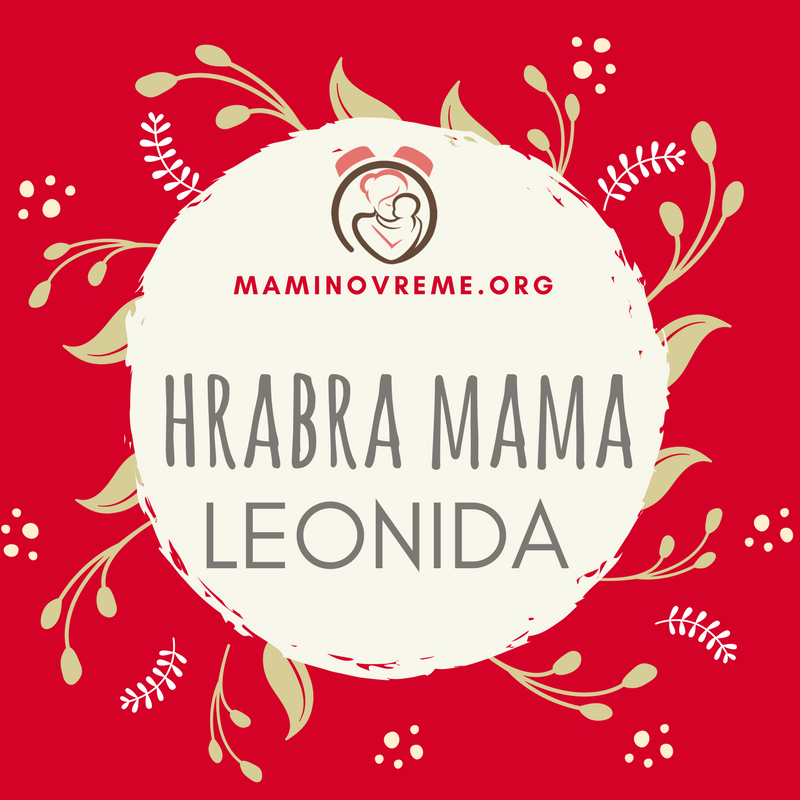 I am Leonida Mrgole, a woman, a daughter, a sister, a wife and a mom of four. My profession is my passion. My husband and I work as co-therapists. We help with relationships with partners, family relationships and parenting. In my free time, I am a blogger, a vlogger, a writer and the creator of my dreams. I am also a woman who discovered her femininity much later, in grown-up years, and I am very proud of that discovery. I have a loving relationship with myself, but on the other hand, I am not afraid to work on myself. I bravely face obstacles and seek ways to overcome them. The middle finger on my left hand (I am left-handed) is always colored differently and is my hallmark. 😊 I love humor, nature, forests, good food, beer, my husband, children and animals. I am a Friend. I am strongly aware of the fact that our relationships are our greatest safety, so I always respect them and take them seriously. I am also a proud co-author of the book entitled „Connect with your teenager“ which has also been translated into English. The book was written on the basis of our personal experience and our experience as therapists. It is about parents’ responses, about changes brought about by parenting, about how parents are the ones who must provide the sense of security. It contains over 200 stories and solutions. We have sold over 5,000 copies in four years in Slovenia. 2. What parenting struggles did you face and how did you overcome it? What I want to say is that there is never anything wrong with the child, that we grown-ups need to change and mature. Nevertheless, I sometimes wished for someone to come and “put my child in order.” But today I know that parents are not the ones who have it rough. Teens have to deal with changes. Sometimes they do not even know what is happening to them and that is hard. That is why they need parents to take them through this period. Parents who understand what is going on. Who know how to be empathic. The good thing is there are ways for parents to learn about this. A special struggle for us mothers is also to actually do what we say we will do. This means that we consciously try not to say foolish things when we are helpless (example: If you don’t brush your teeth now, you won’t be going to the birthday party tomorrow). But in reality, we can hardly wait for this birthday party so we can take a break. As soon as we say it, we know it won’t happen. 😊 We dig ourselves a rather deep hole with such behavior. In order not to do it (too) often, we must make sure that we are connected with ourselves and our emotions. To have our behavior under control. Is that difficult? At the beginning, it is. But then we become mentally fit and that is a great feeling. The feeling that our behavior is under our control. That we are the masters of dynamics in our relationships with children. 3. What parenting struggles do you still encounter? Our children are now independent, grown up. I sometimes wonder if there is something wrong with me, but I am not a typical mom. Motherhood has taught me to observe, keep quiet, wait. I learned that children need to be allowed to experience things. This does not mean that we leave them alone. It means that we are there for them and just watch, encourage. Children can explore and ask for help. But in the end, success belongs to them. Of course, sometimes also failure. This way children learn what they do not want to keep repeating in life. For me as a mom, it is challenging to endure this, particularly when it comes to difficult experiences. But most of the time, I am aware that I need to let that happen. Sometimes I fail. When we master the part that was a struggle for us, new struggles always arise. From the simple fact that we develop in our relationships with other people. We grow. That is why we often say that children are our teachers. Learning goes both ways. If we allow it to be and let it into our awareness, of course. I believe that, in situations with children, which are struggles, difficult and perhaps recurrent, it is worth asking ourselves: “What can I learn about myself from this situation?” Relationships are like forms of life, so we cannot expect difficult moments to just disappear. This is the most extraordinary time, the greatest gift. When children were little, it was play. Our play included cleaning, cooking, tidying up etc. We always made these moments fun. Trips. Explorations. Talks. Sometimes when I was busy, I included them in my process. Like – I need an assistant. It is unbelievable how children always want to help, be part of our story. We do not take advantage of that often enough. Children can do so much more than we think. Instead of saying: “He’s too little,” we can say: “Let me see how good he is at this,« and explore together with him. I particularly tried to be there for them, to respond. It is not always so romantic. Sometimes things get complicated. We do not know. We cannot do it. The good news is that children understand this. We do not “spoil” a child with one poor response. Children want to be connected with us. Safe attachment is our basic need. During motherhood, I really tried to develop as a mom, not to repeat the same patterns over and over again, and to develop as a woman. I think the children are very proud of that, and they say that to me. 5. Question of the previous Brave Mom: Has anyone told you honestly that parenting is not always like in a movie? From stinky diapers, through high temperatures, broken hands at training, compilation of fractions? Honestly? I think that if anyone had told me, I would not have heard it this way. Life brings experiences that are not comparable with dirty diapers, temperature, broken arms etc. With four children, I spent a lot of time in the E.R., it was part of life, collecting experiences. Then situations come which cannot be cured with plaster or pills, when you have to help your child get through hell and you simply have no other choice. I wonder if we would even have children if someone told us that. On the other hand, not everything about this can be said. Every mom experiences it in a different way. Some moms find it hard, while for others, it is a piece of cake. So it is a good thing that we socialize, share experience, do not judge. Do you believe the myth that children always come first regardless of how you (the mother) feel? Ja sam Leonida Mrgole, žena, ćerka, sestra, žena i mama njih četvoro. Moja profesija je moja strast. Moj suprug i ja radimo kao ko-terapeuti. Pomažemo partnerima oko njihovog odnosa, porodičnim odnosima i roditeljstvom. U slobodno vreme, ja sam bloger, vloger, pisac i tvorac svojih snova. Ja sam i žena koja je otkrila njenu ženstvenost mnogo kasnije, u odraslom dobu i veoma sam ponosna na to otkriće. Imam ljubav prema sebi, ali sa druge strane, ne plašim se da radim na sebi. Ja se hrabro suočavam sa preprekama i tražim načine da ih prevladam. Srednji prst na mojoj levoj ruci (ja sam levoruka) uvek je drugačije obojen i to je moje obeležje. 😊 Volim humor, prirodu, šume, dobru hranu, pivo, mog muža, dece i životinja. Ja sam prijatelj. Snažno sam svestan činjenice da su naši odnosi naša najveća sigurnost, tako da ih uvek poštujem i ozbiljno shvatam. Takođe sam ponosan koautor knjige pod nazivom „Povežite se sa svojim tinejdžerom“ koji je takođe preveden na engleski. Knjiga je napisana na osnovu našeg ličnog iskustva i iskustva kao terapeuta. Reč je o roditeljakim odgovorima, o promenama koje donosi roditeljstvo, o tome kako su roditelji oni koji moraju da pruže osećaj sigurnosti. Sadrži preko 200 priča i rešenja. Prodali smo preko 5.000 primeraka za četiri godine u Sloveniji. Ono što želim da kažem jeste da nikada ništa loše nije sa detetom, da se mi odrasli moramo promeniti i sazreti. Ipak, ponekad sam želela da neko dođe i „dovede moje dete u red“. Ali danas znam da nisu roditelji ti kojima je teško. Tinejdžeri moraju da se nose da promenama. Ponekad oni čak i ne znaju šta im se dešava i to je teško. Zato su im potrebni roditelji da ih vode kroz ovaj period. Roditelji koji razumeju šta se dešava. Koji znaju kako da budu empatičani. Dobra stvar je da postoje načini kako roditelji ovo mogu da nauče. Posebna borba za nas majke je da zapravo uradimo ono što smo rekle da ćemo uraditi. To znači da svesno pokušavamo da ne kažemo glupe stvari kada smo bespomoćne (primer: ako sada ne opereš svoje zube, sutra nećeš ići na rođendansku zabavu). Ali u stvarnosti, jedva čekamo ovu rođendansku zabavu pa da se možemo odmoriti. Čim to kažemo, znamo da se to neće desiti. 😊 Takvim ponašanjem sebe zakopavamo u prilično duboku rupu. Da ne bi to radili (previše) često, moramo biti sigurni da smo povezani sa sobom i sopstvenim emocijama. Da svoje ponašanje imamo pod kontrolom. Da li je to teško? Na početku jeste. Ali onda postanemo mentalno sposobni i to je sjajan osećaj. Osećaj da je naše ponašanje pod našom kontrolom. Da smo mi gospodari dinamike u našim odnosima sa decom. Naša deca su sada nezavisna, odrasla. Ponekad se pitam da li je nešto loše u meni, ali ja nisam tipična mama. Majčinstvo me je naučilo da posmatram, ćutim, čekam. Naučila sam da deci treba dozvoliti da dožive stvari. To ne znači da ih ostavimo na miru. To znači da smo tu za njih i samo gledamo, podstičemo. Deca mogu istraživati i zatražiti pomoć. Ali na kraju, uspeh pripada njima. Naravno, ponekad i neuspjeh. Na taj način deca uče šta je to što ne žele da ponavljaju u životu. Za mene kao majku, izazovno je to da izdržim, posebno kada su u pitanju teška iskustva. Ali većinu vremena, svesna sam da moram dopustiti da se to desi. Ponekad ne uspem. Kad savladamo deo koji je za nas bio borba, uvek se pojavljuju nove borbe. Iz jednostavne činjenice da se razvijamo u našim odnosima sa drugim ljudima. Rastemo. Zbog toga često kažemo da su deca naši učitelji. Učenje ide u oba pravca. Naravno, ako to dozvolimo da bude i da to pustimo u našu svest. Verujem da se, u situacijama sa decom koje se borbe, teške i možda ponavljajuće, vredi zapitati: „Šta mogu naučiti o sebi iz ove situacije?“ Odnosi su kao oblici života, tako da ne možemo očekivati da teški trenuci samo nestanu. Ovo je najizuzetnije vreme, najveći poklon. Kada su deca bila mala, bila je igra. Naša igra je uključivala čišćenje, kuvanje, sređivanje itd. Uvek smo činili ove trenutke zabavnim. Putovanja. Istraživanja. Razgovori. Ponekad kada sam bila zauzeta, uključivala sam ih u moj proces. Kao – potreban mi je pomoćnik. Neverovatno je kako deca uvek žele da pomognu, da budu deo naše priče. Mi ne koristimo dovoljno često prednost toga. Deca mogu učiniti mnogo više nego što mi mislimo. Umesto da kažemo: „On je premali“, možemo reći: „Hajde da vidim koliko je dobar u ovome“ i istraži zajedno sa njim. Posebno sam pokušavala da budem tu za njih, da odgovorim. Nije uvek tako romantično. Ponekad se stvari zakomplikuju. Ne znamo. Ne možemo uraditi. Dobra vest je da deca to razumeju. Mi ne „pokvarimo“ dete sa jednim lošim odgovorom. Deca žele da budu povezane sa nama. Sigurna vezanost je naša osnovna potreba. Tokom majčinstva, stvarno sam se trudila da se razvijam kao mama, da ne ponavljam iste obrasce iznova i iznova i da se razvijam kao žena. Mislim da su deca veoma ponosna na to i to mi kažu. 5. Pitanje prethodne mame: Da li ti je neko iskreno rekao da biti roditelj nije uvek kao na filmu? Od smrdljivih pelena, preko visokih temperatura, polomljenih ruku na treninzima, sabiranja razlomaka? Iskreno? Mislim da ako mi je neko rekao, ne bih to čula ovako. Život donosi iskustva koja se ne mogu uporediti sa prljavim pelenama, temperaturom, slomljenim rukama itd. Sa četvoro dece, provela sam puno vremena u hitnoj, to je bio deo života, prikupljanje iskustva. Zatim dolaze situacije koje se ne mogu izlečiti gipsom ili pilulama, kada morate pomoći svom detetu da prođe kroz pakao i jednostavno nemate drugog izbora. Pitam se da li bi čak imali i decu da nam je neko to rekao. Sa druge strane, ne može se sve o ovome ni reći. Svaka mama to doživljava na drugačiji način. Nekim mamama je ovo teško, a za druge, to je lagano. Dakle, dobro je što se družimo, delimo iskustvo, ne osuđujemo. Da li veruješ u mit da deca uvek dolaze na prvo mesto, bez obzira kako se ti (majka) osećaš? Ovaj unos je postavljen Hrabre mame i obeležen kao dobar roditelj, donošenje odluka, hrabra mama, hrabre mame, izazov roditeljstva, mamino vreme, odnos roditelj-dete, srećna porodica, zadovoljna mama, zadovoljna porodica, zdrava porodica, zdravo dete. Označiti link. ← Hrabra mama i izazov: Da li sam spremna da budem majka?